Humans, elves, dwarves, and gnomes have lived and worked together for centuries; however, those centuries of peace are nearing an end as these races begin to fight amongst themselves. War is rapidly approaching and the Child Surprise is wanted by many for the power she houses within her to turn the tide of the impending battle. The Child Surprise, a young princess name Cirilla, has the power to change the world or destroy it. But she is not alone, for she was destined to meet the famous witcher Geralt of Rivia and Geralt was destined to protect her from the many who so desperately want her power. And thus officially begins the story of the witcher in Andrzej Sapkowski’s first book of his Witcher series, Blood of Elves. The story “A Question of Price” told by Geralt in The Last Wish had the Queen of Cintra, Calanthe, promising her granddaughter, the Child Surprise, to Geralt. The very end of The Last Wish left readers with Geralt leaving Nenneke and Melitele’s Temple in search of the Child Surprise, for he had been waiting for her to be born. After a siege on her home in Cintra, the Child Surprise, Princess Cirilla, is found by Geralt. Young, alone, and afraid, Geralt takes Ciri under his protection and destiny begins to work its magic. What a way to begin a fantasy series. With the plot being about a child of destiny and this child being destined to someone else and that someone else being said child’s protector, one would think the story is a typical, cliché, and predictable fantasy story. On the contrary, Blood of Elves is incredibly unique and is in no way predictable. The first in The Witcher Series is, like its predecessor: well-written, action-packed, and humorous. 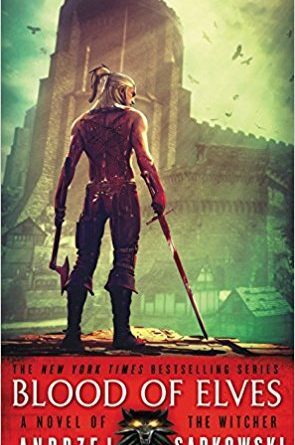 With the premise stating that Geralt and Ciri were destined to be together, it is great to begin with the witcher and the princess. Their relationship is not that of lovers, but rather as a father and daughter and it works beautifully! Because of destiny, Geralt is thrust into the role of not only protector, but of father and it is one he never thought he would have. Same goes for Ciri: she was very young when she lost her parents and Geralt is not only her guardian, but a father she doesn’t remember having. One would think before reading that, due to Geralt’s personality in The Last Wish, he may find Ciri a nuisance; however, the scenes with them together are wonderful to read. They get along very well, joke around with each other, and Geralt has taught Ciri to defend herself, though he still keeps a sharp eye on her. This is a pleasant surprise for readers who assumed the aforementioned. There is a wonderful blend of serious action and witty comedy throughout the story. Sapkowski improved on writing his battle scenes, making it easier for the reader to imagine how Geralt and the others are fighting. Dandelion is still as humorous as ever and a new character is introduced that is just as funny: Triss Merigold. Triss is a sorceress like Yennefer and met Geralt through her as well. When she travels to find Geralt at Kaer Morhen, the home and training grounds of the witchers, she is able to meet Ciri there. Geralt and a handful of other witchers have been training the young princess on how to fight and defend herself; however, these men have forgotten a very important fact about Ciri that Triss was not shy to remind them about: that she is a teenage girl blossoming into womanhood. The exchange of dialog between Triss and the witchers during this explanation is clever and a crack up for readers to read. The only true downside about Blood of Elves is the length of the chapters. There are only seven chapters, but each one spans roughly about 50 pages each. This makes it difficult to pick a stopping point, whether a reader wants to stop or not; however, there are gaps between the events that happen where readers can stop if they need to, which Sapkowski probably strategically placed knowing how long he would make each chapter. And, if readers ever forget while reading what the title of the book is, do not fear. Sapkowski refers to the title many times. The first time it is mentioned is in the first 20 pages, for of the different names given to Ciri (child of destiny, the Child Surprise), she is also called a child of Elder Blood, the blood of elves. Also within these first few pages, much is explained about destiny, Ciri, and how Geralt and Ciri were destined to be together, so anyone who has not read The Last Wish will be caught up on what is happening and those who have read it will be reminded. 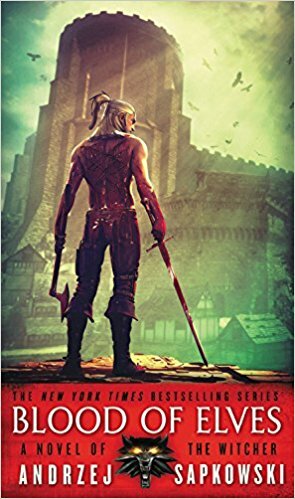 Blood of Elves is a beautifully written book and a wonderful way to officially begin The Witcher Series. Every turn of the page offers events and happenings that will make it difficult to put the book down, disregarding the long chapters and the difficulty in finding a stopping point. Readers will admire Geralt more as a hero than he was in The Last Wish and will fall in love with his father-daughter relationship with Ciri. It is a book that one can start with if one is curious about the series, but the series would be much more enjoyable and easier to follow if one has read the prequel first. Due to its well-written prose and the large world Sapkowski created, one will immediately want to pick up the sequel, The Time of Contempt, shortly after finishing.